The Comma Polygonia c-album is one of the earliest butterflies you might encounter each spring. I saw my first this year on the 25th March. Generally I’m sad to say that for many butterfly species numbers are in decline and this extremely wet summer really hasn’t helped. 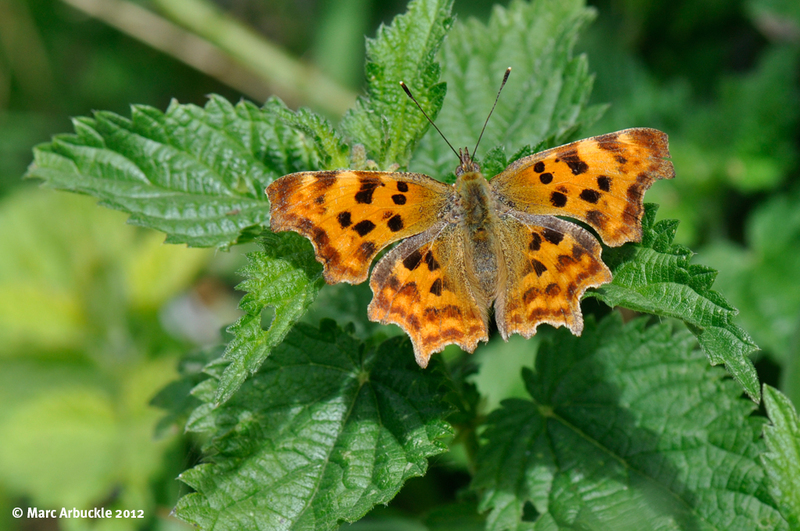 However, the Comma is one of our few butterfly success stories. Just over a century ago it was on the verge of extinction in Britain with fewer than half a dozen records in many southern counties. Then, just after the First World War it started to recover again. No one is really sure why it declined or why it has recovered but since the 1950s it has expanded its range rapidly making this raggedy-winged butterfly an increasingly common sight again, even in gardens. With wings closed it is one of our most impressively camouflaged butterflies. Its ragged outline and blotchy pattern of browny-grey so accurately resembling a dead leaf it can easily be overlooked. But this is a good thing as it needs to be well camouflaged to protect it from birds and mice when it hibernates at the base of a tree amongst drifts of dry leaves through the long winter months. I suspect the one I’ve photographed is a female as the male has even more jagged wings and is usually slightly darker. That and the fact that I watched it slowly flutter from nettle to nettle as though it was looking for suitable spots to lay her eggs. It gets its common name from the white comma-like mark on its rear underwing.